There is a distinct difference between Bilbo’s nursery rhyme style riddles and those of Gollum, which tend to be ancient ones. For example, his last riddle, delivered when he thinks “the time had come to ask something hard and horrible”, derives from a poem in Old English, the riddle-game (or more precisely the wisdom-testing exchange) between Solomon and Saturn in the Old English verse of the same name. In this Saturn, who represents heathen knowledge, asks Solomon: “What is it that goes on inexorably, beats at foundations, causes tears of sorrow, into its hands goes hard and soft, small and great?”. The answer given in Solomon and Saturn is not ‘Time’ as in Bilbo’s desperate and fluky reply, but ‘Old age’, which is then explained in terms similar to those of Gollum’s riddle: “She fights better than a wolf, she waits longer than a stone, she proves stronger than steel, she bites iron with rust: she does the same to us”. Then there is Gollum’s ‘fish riddle’ (“Alive without breath, As cold as death; Never thirsty, ever drinking, All in mail, never clinking”), which is echoed both by a riddle set in the Old Norse wisdom contest in The Saga of King Heidrek the Wise and in a medieval poem from Worcestershire, Layamon’s Brut: in this dead warriors lying in a river in their mail are seen as strange fish. Gollum’s riddles, cruel and gloomy, associate him firmly with the ancient world of epic and saga, heroes and sages. But Bilbo can play the game too, even though his riddles are significantly different in their sources and nature. Three of them, ‘teeth’, ‘eggs’, and ‘no-legs’, come from traditional nursery rhyme. But then, as a philologist, Tolkien held the firm conviction that, just as children’s fairy tales of elves and dwarves had some long-lost connection with the time when such creatures were material for adults and poets, so modern playground riddles and rhymes were the last descendants of an old tradition. This was a serious matter for Tolkien, who wrote extensively on so-called ‘modern’ nursery rhymes and the reality of their ancient antecedents. When Bilbo replies to Gollum’s ancient riddles with ones that, to our ears at least, sound more familiar, they are not then so very far apart after all. As Gandalf was to say to Frodo many years later, “They understood one another remarkably well… Think of the riddles they both knew, for one thing”. Even in The Hobbit, however, it is clear that Bilbo does not simply regard riddles as nursery rhymes fit only for children. He has not lost his grip on an old tradition – one in which such contests were regarded as sacred. As for Gollum himself, unlike many of Tolkien’s other ‘creations’ (wargs, ents, woses etc.) there is no known source for him other than Tolkien’s own mind – he was the author’s very own idea, and a brilliant one at that. Wretched, noble, ambiguous, deranged, schizophrenic, murderous, addicted, pitiable – all of these objectives and more have been used to describe old Smeagol, yet none of them have come close to encapsulating the character. Whatever else the second Hobbit film offers it won’t be more of Gollum, and it will be all the poorer for that. What a great post! Loved the examination of the tradition behind the riddle contest from one of my favourite chapters from 20th century Literature. This is why Tolkien’s stories endure- all were meticulously and consciously constructed upon the traditions, themes and motifs that came before. 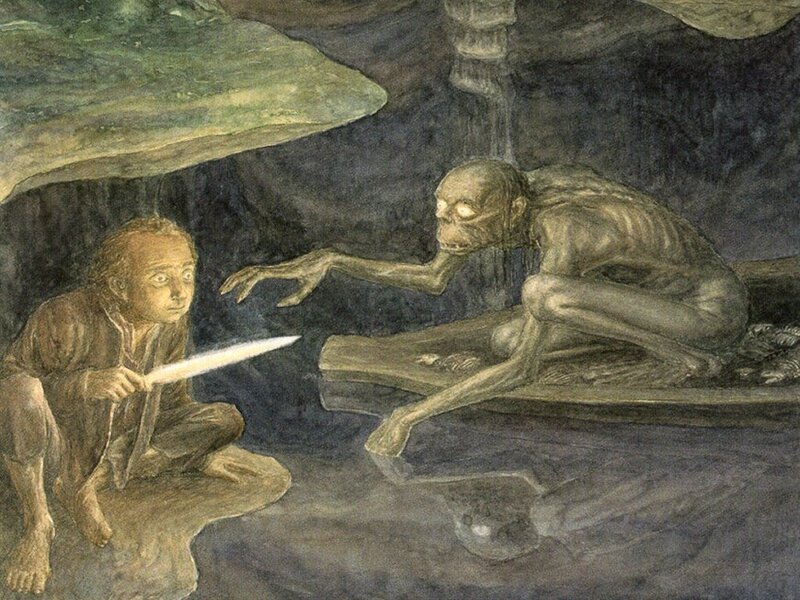 Smeagol/Gollum is certainly the most complex of characters- how interesting to find out he had no source other than Tolkien’s vast and beautiful imagination. Likewise, this is a fantastic analysis of undoubtedly one of the highlight moments in ‘An Unexpected Journey’. Wonderful post! Fascinating post. Thanks so much for all these insights. I agree that the riddle scene was good, but An Unexpected Journey a bit disappointing overall. Too many battle scenes, for one thing. There just wasn’t that much fighting in the book. What an awesome post! I am so glad I found your blog. Definitely following.